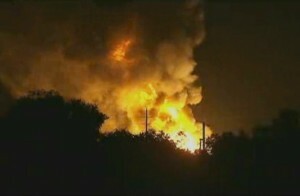 Flames erupt from the Blue Rhino plant fire in Tavares, FL, July 29. Human error and equipment malfunction are the possible causes of a series of explosions that spawned a 20-by-20 foot fireball at a central Florida propane plant that left eight injured. Tavares, FL, Fire Chief Richard Keith identified the possible causes Tuesday, but was leaning toward ruling out sabotage. After two days officials in Tavares said they capped all of the propane leaks after a series of explosions last Monday night at the gas plant. As of Wednesday morning, authorities were burning off any propane left in the area. The federal Occupational Safety and Health Administration launched an investigation into the Monday night incident at the Blue Rhino propane plant in the town northwest of Orlando, as did the Florida State Fire Marshal’s office. No one died, but eight workers ended up injured, four critically. Those injured include a worker hit by a car on a nearby road while fleeing the explosions. Hoses designed to spray water on the large tanks didn’t go off because they had to manually activate, which required someone braving dangerous conditions.